Saturday I woke up in a somewhat gloomy mood. I spent Friday evening excited and feeling like I had some direction I could follow certain dreams and aspirations I could work towards. Despite trying to keep a positive disposition and attitude since hitting rock bottom in December this was the first time I thought of the future and got excited. Saturday morning came around though and I woke up feeling the familiar mental exhaustion, a warning sign for me that I’m ignoring Shadow (which is what I call my depression and anxiety) instead of listening and looking after it like a friend. I think it’s a big turn around for me that I recognised this and instead of continuing to ignore it and carrying on letting Shadow get bigger and bigger I decided to muster the little energy I did have to tackle it head on and look after myself. I cancelled my driving lesson, declined an offer to go out with my sister in law to do some shopping, as much as I love spending the day with my nieces I knew I needed at least one day to just do things that made me happy but required little energy because I was running low. I made a mind map of lots of fun things I could do that didn’t involve going outside or being social – so basically things that would recharge my batteries as it were. It’s so important we take time to look after ourselves and I’m so glad I took the weekend for myself as I feel so much better and more clear headed. Tidying/De-cluttering the Kitchen – On the surface it was clean and relatively clutter free but it was niggling at my mind that inside the cupboards and fridge was utter chaos! Nothing gave me more joy than sorting them out and knowing the next time I open the cupboards tins would be in neat lines in a sensible order and the fridge would be tidy too! 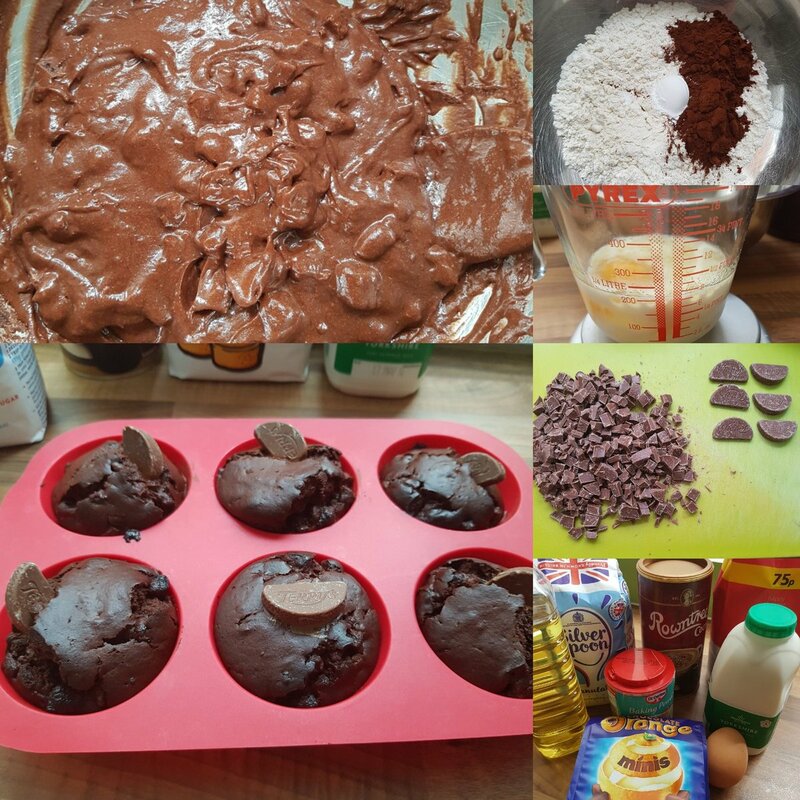 Terrie’s Chocolate Orange Muffins (recipe here) – I made these for the first about 3 years ago and they went down a treat but I have a very on off relationship with baking and so I didn’t make them again until Saturday! So easy to make, so quick to bake and almost as quick to demolish the whole batch! Reading – I think I’ve mentioned a few times in passing that I have been in a year long reading slump. Before this slump hit I constantly had a book in my hand and even though I’m a slow reader would get through 60+ a year. 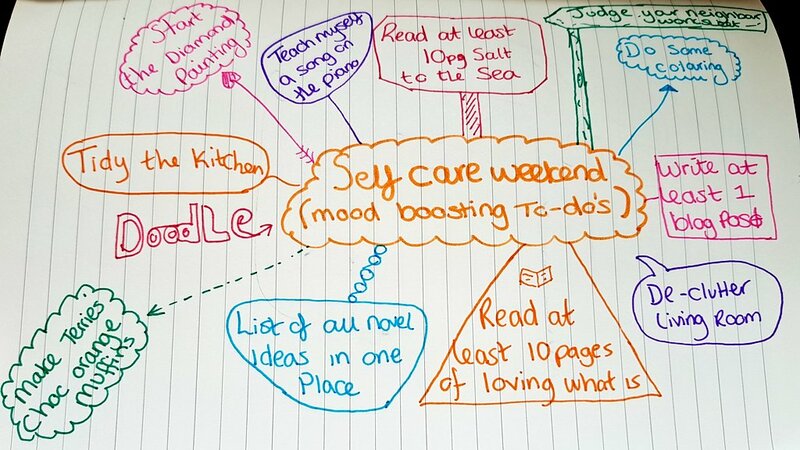 On my mind map I put a little goal of reading 10 pages of Salt to the Sea (a re-read of a favourite novel of mine) – I smashed it and read just over 50 pages while waiting for my muffins to bake! I don’t want to jinx it but it feels good to be getting back between the pages of good books! EuroVision2018 – I’d been excited for a few weeks for EuroVision and this year I managed to get to Saturday without hearing a single song. I loved it, it was exactly the light hearted campy fun I come to rely on EuroVision to provide. My top 3 were Israel, Ireland and Germany and I was so happy when Israel won! Lay In – Even on a weekend I tend to be up before half 7 (weekdays it’s 6) so I allowed myself to sleep for longer it was still only up to about half 8 but those few extra hours helped. When I woke up I felt quite refreshed and ready to get up instead of feeling groggy or like it was a chore. Diamond Painting – on my pay day just gone I saw an add on Instagram for Diamond painting and it looked like something I would really enjoy so I brought one on a whim (link here). It turned up just over a week later and Sunday was my first opportunity to start it. In just under 3 hours I only managed the top 2 inches. I felt relaxed and care free while doing it. It kept my mind busy and focused on putting the right beads on the right spots instead of the dark fog that still hadn’t completely lifted. Doesn’t really look like much now but hoping it will all come together as I get half way through. Re-watching Byron Katie Videos (link to channel here) – Mum introduced me to the work of Byron Katie (who is a kind of motivation speaker/spiritual teacher of sorts) at the beginning on March and her works made a lot of sense to me as well as helping my mum with her mental health greatly in the last 6 months too. I haven’t really visited her works lately and after watching a few of my favourite sessions I felt a lot lighter in my mind. 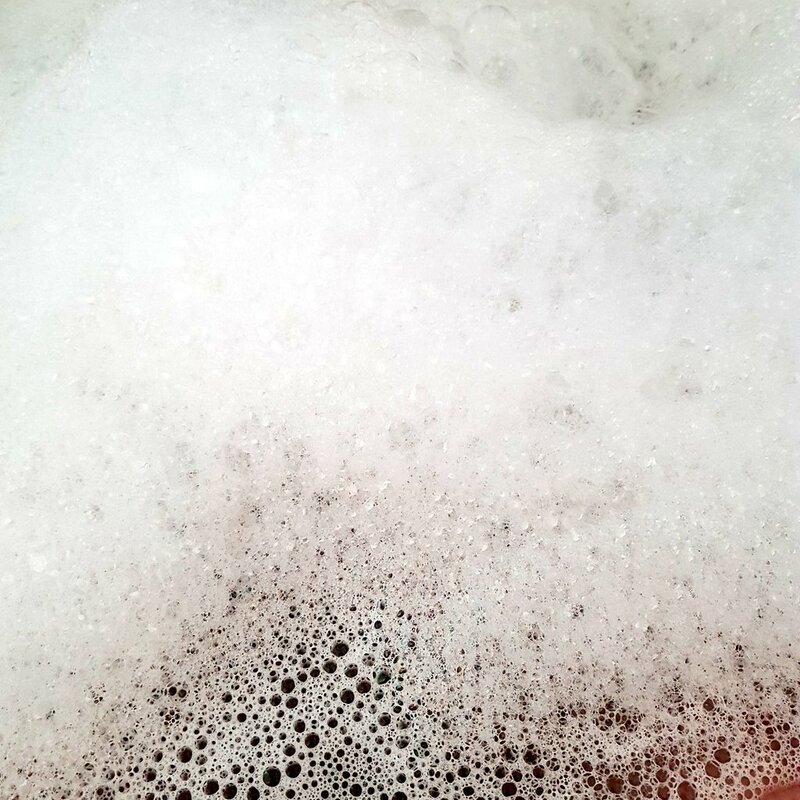 Bubble Bath – while watching my Byron Katie videos I enjoyed a lovely long soak in the tub accompanied by a mass of bubbles and the scent of my favourite candle that I light very rarely because it was so expensive. Some times something as simple as having a soak can be just what is needed. As I sunk in I felt the water unknotting my shoulders and it was pure bliss… till the cat nudged the door open and let a draft in. I may not have ventured out but I do feel like I accomplished quite a bit this weekend best of all my mood does feel lighter and I do feel recharged enough to tackle the week. I’m not 100% back on track but it’s a constant attempt to win a thousand battles a day when it comes to mental health, or at least that’s how it feels for me. Do you have a go to crafty hobby that helps you unwind? Are you currently reading any good books? Aww this sounds like a fantastic weekend! It’s great you were able to do productive things, like sorting your cupboards and baking, even if you decided to stay in. I really need to get back into reading books. I started the year off so well, but I’ve neglected it lately. Sounds like the perfect weekend! I love staying at home and relaxing every so often. Loved the look of your baking session, the perfect treat for a relaxing weekend! It really was the perfect treat, I think I might have to make them again this weekend. I am so glad that you allowed yourself to do this for you! It is so important to look in the mirror and ask: what can i do for you today? – it is something that Louise hay once adviced. And Ive been using this since. When you know that you are so exhausted it is clearly time that you take good care of yourself. Sounds like you had a fabulous time doing that. I know and love the work of Byron katie. It really helps as well. I wish we had a bath, I could really do with one now! Sometimes we all just need a day to recharge and relax. Iam glad you were able to take the time to look after yourself when you needed it! I’m so happy that you took a step back and had a weekend for yourself. It sounds like it was much needed. Did you finish your re-read of Salt to the Sea? !